Owens Valley (Numic: Payahǖǖnadǖ, "place of flowing water") is the now-arid valley of the Owens River in eastern California in the United States, to the east of the Sierra Nevada and west of the White Mountains and Inyo Mountains on the west edge of the Great Basin. The mountain peaks on either side (including Mount Whitney) reach above 14,000 feet (4,300 m) in elevation, while the floor of the Owens Valley is about 4,000 feet (1,200 m), making the valley one of the deepest in the United States. The Sierra Nevada casts the valley in a rain shadow, which makes Owens Valley "the Land of Little Rain." The bed of Owens Lake, now a predominantly dry endorheic alkali flat, sits on the southern end of the valley. Owens River from Bishop Tuff tableland. The valley provides water to the Los Angeles Aqueduct, the source of one-third of the water for Los Angeles, and is infamous as the scene of one of the fiercest and longest-running episodes of the California Water Wars. These episodes inspired aspects of the 1974 film Chinatown. As well, the now-arid nature of the valley is likely due to LADWP depleting the water of the region. For example, Owens Lake was completely emptied by 1926, only 13 years after LA began diverting water. Towns in the Owens Valley include Bishop, Lone Pine, Independence and Big Pine; about 25,000 people live in the valley. The major road in the Owens Valley is U.S. Route 395. About three million years ago, the Sierra Nevada Fault and the White Mountains Fault systems became active with repeated episodes of slip earthquakes gradually producing the impressive relief of the eastern Sierra Nevada and White Mountain escarpments that bound the northern Owens Valley-Mono Basin region. Owens Valley is a graben—a downdropped block of land between two vertical faults—the westernmost in the Basin and Range Province. It is also part of a trough which extends from Oregon to Death Valley called the Walker Lane. The western flank of much of the valley has large moraines coming off the Sierra Nevada. These unsorted piles of rock, boulders, and dust were pushed to where they are by glaciers during the last ice age. An excellent example of a moraine is on State Route 168 as it climbs into Buttermilk Country. This graben was formed by a long series of earthquakes, such as the 1872 Lone Pine earthquake, that have moved the graben down and helped move the Sierra Nevada up. The graben is much larger than the depth of the valley suggests; gravity studies suggest that 10,000 feet (3,000 m) of sedimentary rock mostly fills the graben and that a very steep escarpment is buried under the western length of the valley. The topmost part of this escarpment is exposed at Alabama Hills. The Owens Valley has many mini-volcanoes, such as Crater Mountain in the Big Pine volcanic field. Smaller versions of the Devils Postpile, can be found, for example, by Little Lake. The valley contains plants adapted to alkali flat habitat. One of these, the Owens Valley checkerbloom (Sidalcea covillei), is endemic to Owens Valley. The valley was inhabited in late prehistoric times by the Timbisha (also called Panamint or Koso) in the extreme south end around Owens Lake and by the Mono tribe (also called Owens Valley Paiute) in the central and northern portions of the valley. The Timbisha speak the Timbisha language, classified in the Numic branch of Uto-Aztecan language family. The closest related languages are Shoshoni and Comanche. The Eastern Mono speak a dialect of the Mono language which is also Numic but is more closely related to Northern Paiute. The Timbisha presently live in Death Valley at Furnace Creek although most families also have summer homes in the Lone Pine colony. The Eastern Mono live in several colonies from Lone Pine to Bishop. Trade between Native Americans of the Owens Valley and coastal tribes such as the Chumash has been indicated by the archaeological record. On May 1, 1834, Joseph R. Walker entered Owens Valley at the mouth of Walker Pass. Walker and his group of 52 men traveled up the valley on their way back to the Humboldt Sink, and back up the Humboldt River to the Rocky Mountains. 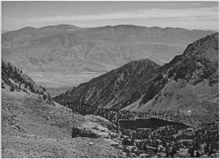 In 1845, John C. Fremont named the Owens valley, river and lake for Richard Owens, one of his guides. Camp Independence was established on Oak Creek nearby modern Independence, California, on July 4, 1862, during the Owens Valley Indian War. From 1942 to 1945, during World War II, the first Japanese American Internment camp operated in the valley at Manzanar near Independence, California. In the early 20th century, the valley became the scene of a struggle between local residents and the city of Los Angeles over water rights. William Mulholland, superintendent of the Los Angeles Department of Water and Power (LADWP), planned the 223-mile (359 km) Los Angeles Aqueduct, completed in 1913, which diverted water from the Owens River. The water rights were acquired in a deceitful manner, often splitting water cooperatives and pitting neighbors against one another. In 1924, local farmers were fed up with the purchases and erupted in violence, sabotaging parts of the water system. Eventually Los Angeles acquired a large portion of the water rights to over 300,000 acres (121,000 ha) of land in the valley, almost completely diverting the inflows of water away from Owens Lake. Gary Libecap of the University of California, Santa Barbara observed that the price that Los Angeles was willing to pay to other water sources per acre-foot of water was far higher than what the farmers received. :89 Farmers who resisted the pressure from Los Angeles until 1930 received the highest price for their land; most farmers sold their land from 1905 to 1925, and received less than Los Angeles was actually willing to pay. However, the sale of their land brought the farmers substantially more income than if they had kept the land for farming and ranching. :90 None of the sales were made under threat of eminent domain. As a result of these acquisitions, the lake subsequently dried up completely, leaving the present alkali flat which plagues the southern valley with alkali dust storms. In 1970, LADWP completed a second aqueduct from Owens Valley. More surface water was diverted and groundwater was pumped to feed the aqueduct. Owens Valley springs and seeps dried and disappeared, and groundwater-dependent vegetation began to die. Years of litigation followed. 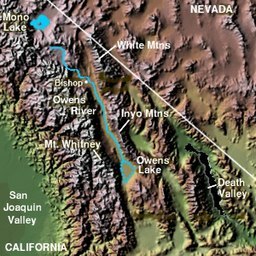 In 1997, Inyo County, Los Angeles, the Owens Valley Committee, the Sierra Club, and other concerned parties signed a Memorandum of Understanding that specified terms by which the lower Owens River would be rewatered by June 2003. LADWP missed this deadline and was sued again. Under another settlement, this time including the State of California, Los Angeles promised to rewater the lower Owens River by September 2005. As of February 2005, LADWP announced it was unlikely to meet this extended deadline. Finally, in 2008, Los Angeles fulfilled its promise and rewatered the lower Owens River. 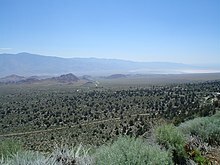 In July 2004, Los Angeles mayor James Hahn proposed barring all future development on its Owens Valley holdings, by proposing a conservation easement for all LADWP land. As of October 2004, Inyo County officials seemed to be resisting the offer of the easement, perhaps due to the prior history of mistrust over LADWP actions. 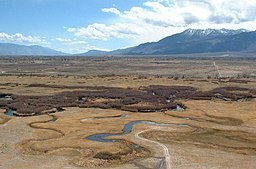 Los Angeles began using a new, organic method of suppressing airborne dust from the dry bed of Owens Lake in 2014 pursuant to an agreement between the city and Great Basin Unified Air Pollution Control District, the Owens Valley air quality regulators, ending a bitter decades-long dispute over the water and dust. The Owens Valley Radio Observatory located near Westgard Pass is one of ten dishes making up the Very Long Baseline Array (VLBA). Bibliography of the Sierra Nevada — for further reading. ^ "Owens Valley". Geographic Names Information System. United States Geological Survey. Retrieved 2009-05-03. ^ a b c Smith, Genny; Jeff Putnam (1976). Deepest Valley: a Guide to Owens Valley, its roadsides and mountain trails (2nd ed.). Genny Smith books. Sierra Club. ISBN 0-931378-14-1. ^ Austin, Mary Hunter (1903). Land of Little Rain. Houghton, Mifflin and Company. ISBN 0-8263-0358-7. ^ Hogan, C. Michael (2008). Andy Burnham (ed.). "Los Osos Back Bay". Megalithic Portal. ^ Gilbert, Bil (1985) . Westering Man: The Life of Joseph Walker. Tulsa: University of Oklahoma Press. pp. 144–46. ISBN 0806119349. ^ Hart, Herbert M. "Camp Independence (Inyo County)". Digital Desert. ^ Key, V., John W. (1979). The Owens Valley Indian War, 1861-1865 (Thesis). Fort Leavenworth, Kansas: U.S. Army Command and General Staff College. ^ a b c Libecap, GD (2007). Owens Valley Revisited: A Reassessment of the West's First Great Water Transfer. Stanford University Press. ISBN 978-0-8047-5379-1. ^ Erie, Steven P. (2006). Beyond Chinatown: The Metropolitan Water District, Growth, and the Environment in Southern California. Palo Alto, CA: Stanford University Press. p. 39. ISBN 978-0-8047-5140-7. ^ Sahagun, Louis (November 14, 2014). "New dust-busting method ends L.A.'s longtime feud with Owens Valley". Los Angeles Times. 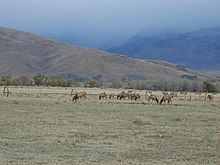 Wikimedia Commons has media related to Owens Valley.